Our Skid Steer Heavy Duty Rock Grapple is great for sifting through dirt in order to remove rocks, debris, and other material. With the tines set at 2 ½” apart, you pick up most everything but the dirt. 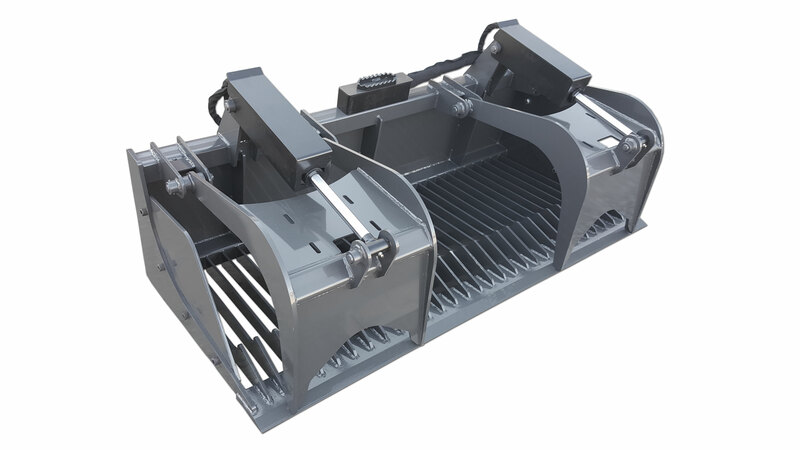 You can also pick up large rocks, logs, brush or just about anything else by use of the grapples that can close at various gaps to handle irregular shapes. We use twin 2” bore by 10” stroke cylinders rated at 4,000 psi on all of our grapples. Great for sifting dirt to remove rocks. Available Sizes: 63", 66", 72", 81", 84". 3/4 x 6 cutting edge. Optional weld on teeth with 1 x 6 cutting edge.